For other places with the same name, see Elbeyli (disambiguation). 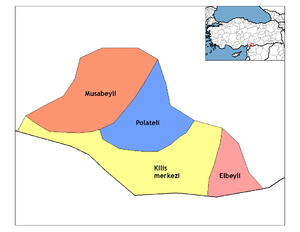 Elbeyli, formerly Alimantar, is a city and district of Kilis Province in Turkey. Elbeyli was controlled by the Seljuk Turks between 1040 and 1157, then the Ilkhanate, and finally by the Anatolian beylik of Dulkadirids before being brought into the Ottoman Empire by Selim I in 1517, following the Battle of Marj Dabiq.